SanKritiLaya is proud to announce their first Concert program in North America and Canada by Shrimathi Vijayalakshmy Subramaniam accompanied by Avaneeswaram Vinu on the violin and Shertalai AnanthaKrishnan on the mridangam, for the Fall 2008 season (September to November 2008). For avid music listeners, Shrimathi Vijayalakshmy is no stranger. Born in a family with a rich musical heritage, Vijayalakshmy Subramaniam started her training in Carnatic Music at the age of five. Her keen sense in grasping musical nuances was evident from a young age. A captivating, melodious and rich voice, good control on rhythm, diction and bhava have earned her noteworthy attention in the music field. 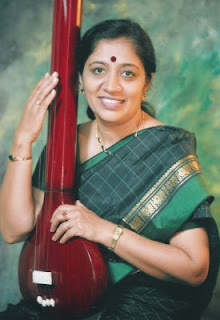 Vijayalakshmy Subramaniam started her training in Carnatic Music in New Delhi at the age of five under Shri K. Padmanabhan, a disciple of Harikesanallur Shri Muthiah Bhagavathar from the Swati Tirunal Academy, Trivandrum. Under the guidance of guru Sangeeta Bhushanam Shri K Krishnaswamy of Annamalai University, she learnt detailed aspects of manodharma sangita or improvisation. Vijayalakshmy further honed her skills under the guidance of eminent Vidwans Shri S.Rajam, Shri T.R.Subramaniam and Shri V.R.Krishnan. Vijayalakshmy enhanced her proficiency for classicism and developed into a musician with a vivid sense of proportion, evident in her concerts. A leading exponent of Carnatic Music, Vijayalakshmy Subramaniam has held audiences worldwide spellbound with her mellifluous voice, her vast repertoire of ragas and compositions, and her perfect control on rhythmic aspects of music since her first concert at the age of twelve in Delhi. Her concerts are rich with Raga Bhava and Sahitya Bhava imparting a tremendous amount of refinement and sophistication in her presentations. Vijayalakshmy has an impressive record of performance with numerous concerts in India and abroad - to rousing REVIEWS. She is a serious researcher of music and has been invited to conduct many workshops by prestigious institutions like the University of Cambridge, UK, Victoria Academy, Wellington, World Vocal Music Festival and the International Musicological Society, Australia. She has also had a successful maiden tour of the US in Spring 2006 amazing the audience with her mellifluous voice and fine bhava. SahityaPriya, Tulasivana Puraskaram, Sangeetha Shikhamani and Gaana Seva Rathnam are some of the awards conferred on Vijayalakshmy. The intense training under eminent gurus like Sangita Bhushanam Sri K. Krishnaswamy, Prof. T.R. Subramaniam, Sri V. R. Krishnan, Sangita Kala Acharya Sri S. Rajam and her uncle Sri S. Balachander and the constant encouragement and dedication of her family has been instrumental in shaping Vijayalakshmy into the fine artist she is today. Vijayalakshmy has performed extensively in India. In Chennai, the cradle of Carnatic Music, she is a regular performer at all its well-known Music institutions. A senior-slot performer at Music Academy, Vijayalakshmy is an A-graded artist in AIR and has performed in the the prestigious Akashvani Sangeet Sammelan Concerts. Avaneeswaram Vinu is a Grade A artist of AIR,Trivandrum. In his very first appearance at the senior slot in the Madras music academy he won two awards as the Best Violinist - Lalgudi.V.R.Gopala Iyer award and Lalgudi Jayaraman award in the years 2004 and 2005. Avaneeswaram Vinu hails from a family of musicians. He had his initial training from his father, Shri. Avaneeswaram .N. Ramachandran, the famous musician and retired principal of R.L.V. College Thripunithura. Later he continued his training under the violin maestro Shri. Mysore .M. Nagaraj. Vinu holds a Ganabhooshanam diploma and Gana Praveena post diploma from Sree Swathithirunal College of Music, Trivandrum. Vinu is a regular performer in the Navarathri Mandapam in Trivandrum Palace. He has participated in the Akashavani Sangeetha Sammelan programmes. Vinu has quietly established himself as a leading accompanist and has provided accompaniment to artistes like Dr. M. Balamurali Krishna, Dr.K.J.Yesudas. Madurai. Shri.T.N.Sheshagopalan, Shri. T.V.Sankaranarayanan, Dr .N. Ramani, Shri. Neyveli Santhanagopalan, Shri. Sanjay Subramaniam, Shri.Thrissur.V.Ramachandran, T.K.Govindrao, Shri T.V. Gopalakrishnan, Shri. Ravikiran , Smt. Sudha Raghunathan, Smt. Sowmya, Smt.Vijayalakshmy Subramaniam,Smt.Bombay.Jayasree,Bombay Sisters and several eminent artists. "...The accompanists were excellent. The violinst was very good and gave fitting replies to everything. " "....Avaneeswaram Vinu ably supported the vocalist on the violin. His professionalism was evident as he comprehensively presented the alaapana without overdoing it even a bit." 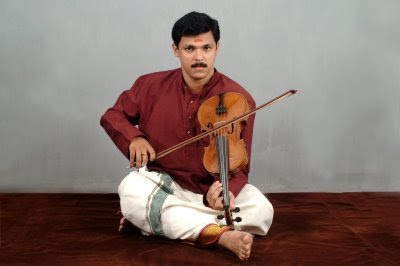 "Avaneeswaram Vinu accompanied on the violin ably"
Born in a family having Music background, Shertalai Ananthakrishnan had initial training in Mridangam from Vidwan Late K.R. Bhaskara Kurup at the age of eight. Later on received advanced studies from Guru Karaikudi R Mani under the cultural scholarship of Govt.of India; also studied carnatic vocal music from his mother Smt Lalitha Ramachandran. He has accompanied several top artists ably, including Dr.Semmangudi R. Srinivasa Iyer,Dr M Balamuralikrishna, Madurai T. N. Seshagopalan, T.V. Sankaranarayanan, O.S. Thyagarajan, U Srinivas, S Shashank, E Gayatri, Vijayalakshmy Subramaniam, P.Unnikrishnan, Sudha Ragunathan, K.J.Yesudas, Neyveli Santhanagopalan, Sanjay Subramaniam,T.M.Krishna, Prince Aswathi Tirunal Rama Varma and many others. Shertalai has also participated in a few Jugal bandhis with hindustani artists. "Special mention must be made of Vid. Shertalai Ananthakrishnan who played very well for the song “ETi janma“. 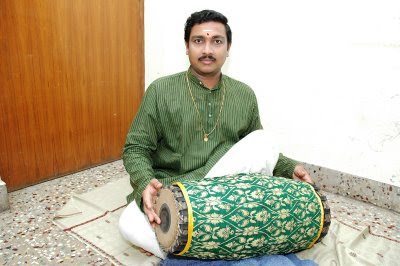 "Shertalai Ananthakrishnan, a bright youngster provided mridangam support in the right dose as the veena always shines better with subdued percussion. Even Ananthakrishnan's tani avartanam was well balanced with multiple segments of soft and subtle rhythmic layers." "Shertalai R. Ananthakrishnan on the mridangam and Kovai G. Suresh on the ghatam exhibited great camaraderie and talent."